Monday, November 30, 2009 \PM\.\Mon\. Daniel Cardinal DiNardo defended the Church’s involvement in removing abortion from the House version of the health care bill after a storm of criticism was leveled against the U.S. Conference of Catholic Bishops (USCCB) of “lobbying” concerning the last minute addition of the Stupak Amendment. 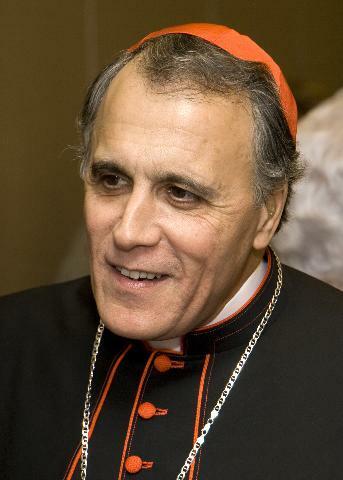 Cardinal DiNardo became chair of the Committee on Pro-Life Activities at the USCCB. He is also the ordinary of the Archdiocese of Galveston-Houston. His Eminence represents a growing cadre of bishops that are leading their flocks out of the wilderness bravely in a fallen world. All throughout 2009 many bishops have entered the national debate in regards to defending fundamental moral values and rectifying misinformation from wayward Catholics in political life. This year seems to be the year the bishops found their voice. Not since Francis Cardinal Spellman graced the New York Archdiocese have we seen the faithful being led with strong ecclesial leadership from all parts of the country. Monday, November 30, 2009 \AM\.\Mon\. I have to say, I’ve been a little surprised by the reaction of many left-leaning Catholics to the Apostolic Visitation of women’s religious congregations. If history is any guide, whether inside the Church or outside, a resistance to third party scrutiny is not a sign of organizational vitality. This resistance is particularly odd in an ecclesiastical context, where one would have thought the bonds of communion between the Holy See and religious orders are fairly strong. Moreover, the reasons proffered for refusing to answer the questions range from unconvincing (‘they don’t understand us’) to the self-indulgently bizarre (‘Women religious…are asking if there is a “Ghandian or Martin Luther King way” to deal with violence they felt is being done to them’). In any case, I think it would be good to offer prayers on their behalf. There are clearly difficult issues here that need to be resolved; and it seems to me that the reaction to the Apostolic Visitation has gone a long way towards demonstrating the need for it in the first place. From the only reliable source of news on the net, the Onion. My oldest son goes off to college next year. I will do my level best to remember how glad I was when I was 18 to be living on my own at college, and to also recall the difference between sage parental advice, and a futile attempt at parental long distance control. Sunday, November 29, 2009 \PM\.\Sun\. What I like most about this definition is that it is descriptive rather than pejorative. It restores a content to the word beyond lazy journalistic slang for ‘someone I don’t like.’ For instance, Richard Dawkins is not a fundamentalist. He may base his identity on what appears to me to be an insufficiently self-critical foundation, but he is neither antimodern, nor antiglobal, nor entirely noncritical. Similarly, as any familiarity with his writings will attest, neither is Pope Benedict XVI. Sunday, November 29, 2009 \AM\.\Sun\. Prior to his conversion to Catholicism, John Henry Cardinal Newman, soon to be Blessed John Henry Cardinal Newman, preached in 1835 a series of Advent Sermons on the Anti-Christ. I have always found them extremely intriguing, and I am going to present them on each of the Sundays in Advent this year. In this first sermon Newman gives us an overview of the Anti-Christ and the time of his appearance. We see in this sermon Newman’s total command of history and how he uses this knowledge to draw out the implications of the few mentions of the Anti-Christ in Scripture. Newman intellectually was always first and foremost a historian of the highest order and he puts this talent to good and instructive use in this sermon. When Newman converted the Church gained one of the finest intellects of the Nineteenth Century or any century for that matter. Much of Newman’s work concerned the working out of God’s plan for salvation through human history, and his examination of the Anti-Christ places that mysterious part of revelation into that plan. Saturday, November 28, 2009 \AM\.\Sat\. Something for the weekend. If You Could Read My Mind, by the unforgettable Gordon Lightfoot, one of the few musical bright spots in the wasteland that was the music of the Seventies. ‘Bout a ghost from a wishing well. With chains upon my feet. You know that ghost is me. As long as I’m a ghost that you can’t see. Friday, November 27, 2009 \PM\.\Fri\. Tareq Salahi and Michaele Salahi decided to go to a White House state dinner on November 24. In a stunning revelation of how lax White House security is, the fact that they were not invited proved to be no hindrance. 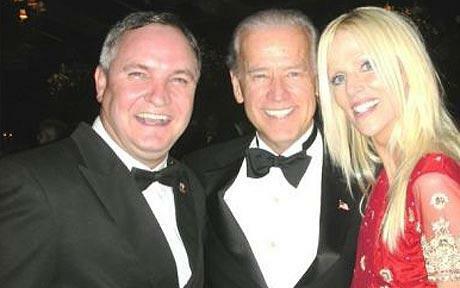 Our ever alert Veep and national clown Joe Biden immediately swung into action and had his picture taken with them. Note to terrorists: if you want to gain access to a private party at the White House, and the Veep will be there, a good looking blonde gal should prove helpful. Keep ’em coming Joe! Your antics are a bright spot during these dark economic days! You are currently browsing the The American Catholic blog archives for November, 2009.